(St. Charles, MO) – Not all conversations about conservation and the environment are political but politics certainly affects those discussions. 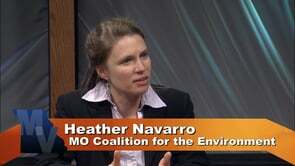 This week, David Stokes from the Great Rivers Habitat Alliance and Heather Navarro from the Missouri Coalition for the Environment each address various debates and concerns affecting the environment in Missouri. Stokes addresses concerns about what his organization feels is ill-advised development in areas that could have a big impact on both natural resources and the economy. Navarro updates us on the state issues they are lobbying for (and against) this legislative session.